Each site visit is conducted by a team of peers with program-specific expertise and, when appropriate, a clinician. 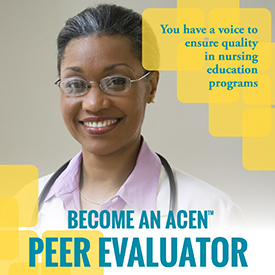 For a review of a single nursing program, typically, there are a minimum of three (3) peer evaluators. Graduate programs offering advanced practice nursing options will have at least one (1) team member with current advanced practice certification. The team member assumes the following responsibilities.